Potpies dominate the microwave meals section of the grocery store freezer, but making them at home requires just a little more effort for an infinitely greater result. Though commonly filled with leftover chicken or turkey, potpies adapt to nearly any combination of ingredients, with a few basic ground rules. You need a combination of meat and vegetables, a thick gravy, and some type of pastry at least on top. This recipe uses canned tuna but lets you choose your favorite accompanying vegetables; you can go with the classic corn, carrots, green beans, and peas, or throw in some broccoli, cauliflower, or mushrooms. In a large saucepan, melt the butter; add the onion and saute it over medium-low heat until tender. Blend in the flour. Add 1/2 teaspoon salt, and the pepper, herb seasoning blend, paprika, and thyme. Stir to distribute the spices. Gradually add the milk, stirring constantly. Cook, stirring constantly, until the mixture starts to bubble and gets thick. Fold in the tuna, vegetables, Worcestershire sauce, and cheese. Taste it, and add more salt and seasoning if necessary. Pour the mixture into a lightly buttered 2-quart baking dish or pie plate. Roll out the pastry to fit the top of the baking dish with an inch or two of overhang. With a sharp knife, cut several slits in the top crust. Place the pastry on the baking dish and flute the edge as desired. Place the baking dish on a baking sheet in the oven. 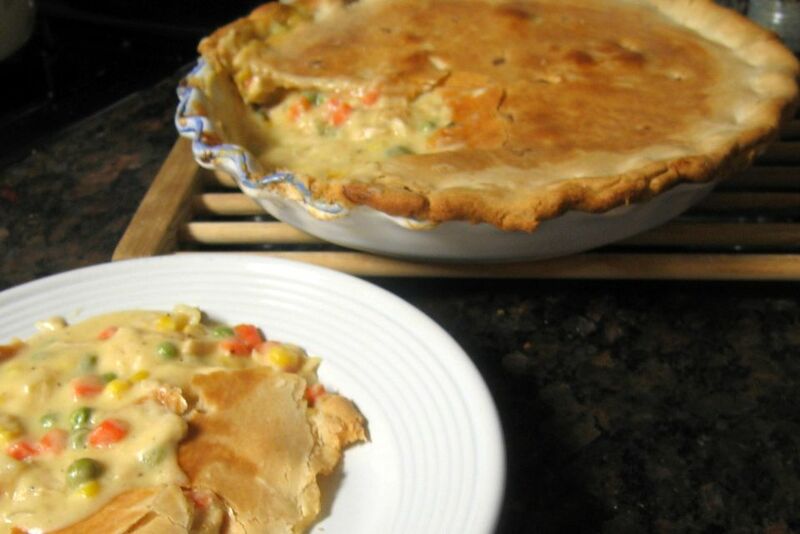 Bake the potpie in the preheated oven for 35 to 40 minutes or until the filling bubbles and the crust turns golden. You can include a bottom crust in a pie plate but you need to partially bake it at 425 F for about 10 minutes before you fill it to prevent sogginess. Line the crust with parchment paper and use pie weights or dried beans to keep it from puffing up in the center. Prick the bottom multiple times with the tines of a fork before you add the filling. To make individual pot pies in soup crocks, cut the pastry into circles for the tops. Substitute puff pastry for the top crust if you prefer.